A CME/CE conference designed for gastroenterologists, hepatologists, primary care physicians, advanced practice nurses, nurses, pharmacists, and physician assistants. The complexity and magnitude of medical advances in the management of digestive diseases make it ever more challenging for clinicians to apply this tremendous amount of information to their practice. 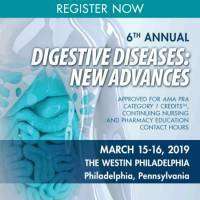 This activity will provide learners with a comprehensive overview of the state-of-the art advances in the diagnostic, therapeutic, and preventive modalities of digestive diseases based on the latest evidence, literature, and clinical research. A thorough review of the current treatment landscape is vital to both clinicians and patients who can benefit from the expansion of therapeutic options. Please see www.globalacademycme.com/gastroenterology for more information, including exhibitor and sponsorship information.